1 small red onion peeled, thinly sliced and soaked with a few msk. or tbls. of red wine vinegar to take their edge off. Dry them well with a paper towel. When done open the package on a plate and let cool for about an 15 minutes so they are cool enough to handle. With a small peering knife peel off the skin and cut into bite size pieces or slice. I like this a bit chunky but not too big. Drain off the onions and dry with a paper towel. 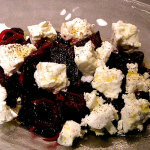 Break up the feta cheese and sprinkle both over the cut up beets. Then sprinkle over the olive oil and the vinegar, salt and pepper to taste and serve chilled but not cold. This is another of those “it’s not really a recipe” because it really is throwing things together that just have a natural affinity for each other. 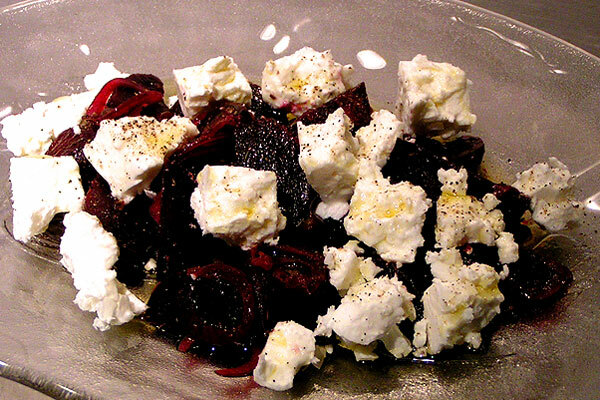 The sweet beets go really well with the salty Feta. As most of you know I really don’t like the onions here and although red onions are already more mild than our white ones I think they are still too strong. Soaking them in a little vinegar will help cut the sharpness and hopefully stop them from repeating well into the night. I love beets and when they are in season my mom used to make beets with everything. The best was chilled as a salad ingredient. Wow, that's a great memory.